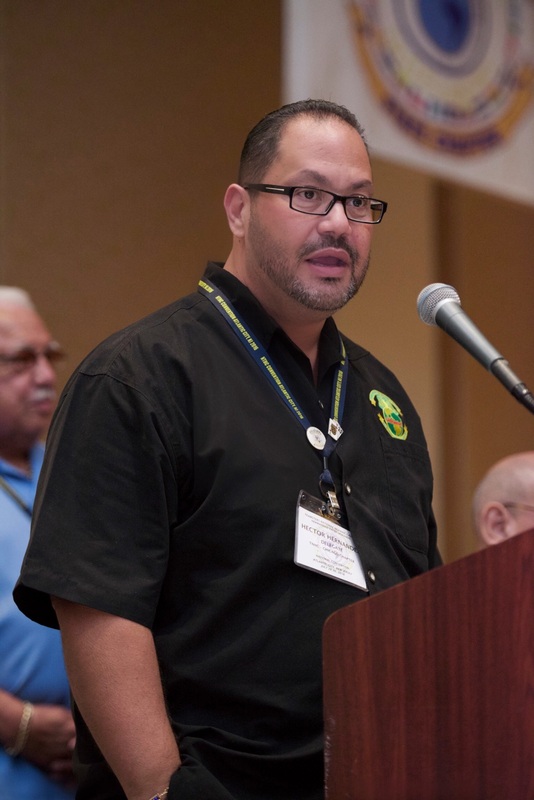 Teamsters Local 700 Trustee and Assistant Business Agent Hector Hernandez was re-elected as Trustee of the Teamsters National Hispanic Caucus (TNHC) during the TNHC biannual conference. The TNHC Executive Board was sworn in for a two-year term on Saturday, July 30 during the last day of the conference in Atlantic City, N.J. Hector also serves as President of the Chicago Teamsters Hispanic Caucus. George Miranda was re-elected as President of the THNC and Ron Herrera was re-appointed as Caucus Executive Director. Also re-elected for two-year terms were Secretary-Treasurer Ruben Torres, Recording Secretary Jesse Miranda, 1st Vice President Maria Perez, 2nd Vice President Jaime Vazquez and Trustees Olga Gonzales, Oscar Gonzales, Alexis Rodriguez and Ashley Alvarado. The election was preceded by remarks heard by the more than 150 delegates in attendance from New Jersey Assemblywoman Annette Quijano from the 20th Legislative District, which includes many municipalities in Union County, N.J.
David Rodriguez, a Teamster and Chairman of the Pennsylvania Democratic Latino Caucus, echoed those sentiments. Ashley Alvarado, President of Local 601 in Stockton, Calif. discussed the Teamsters efforts to organize and elevate Hispanic workers at Taylor Farms and gave an update on efforts to organize the company. Delegates were mesmerized as they heard a testimony from Jose Vega, a worker at Taylor Farms who was terminated from Taylor Farms for union activity and Mike Castro, an organizer on the ground in Tracy. Delegates pledged to take action by leafleting at stores that use Taylor Farms as a supplier. Eddie Rosario, President of GCIU Local 4, spoke of the power of unions to combat poverty among immigrant populations. The California, Chicago, Colorado, Florida, New York, New Jersey, Puerto Rico and Pennsylvania chapters of the TNHC gave chapter reports on notable activities that have occurred within their caucuses over the past two years. A financial report for the national THNC was delivered. Delegates began the afternoon by continuing to commit their values into action for workers at Taylor Farms and celebrated the conclusion of another successful Hispanic caucus with a dinner and a dance. The next national meeting of the Teamsters National Hispanic Caucus will be hosted by Local 901 and will take place in 2018 in San Juan, P.R.